In 2016, Alimentaria turns 40, four decades during which the exhibition has helped drive the most significant changes that have taken place in the food industry, including such areas as distribution, trade and gastronomy. 1976 marked the first time a Spanish trade show had presented the domestic market with a comprehensive and cross-sector selection of products for the food industry and its production processes. 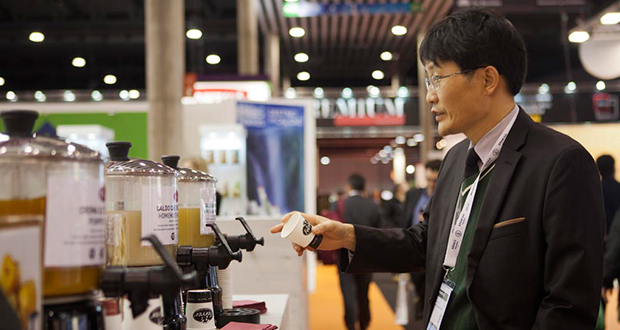 Since that time, the industry has chosen Alimentaria as the venue to present countless creations, discoveries and innovations in all spheres and aspects of the product: processes, packaging, raw materials, ingredients and preservation. The goal has been to meet the changing needs of consumers, responding to their new shopping habits and to the many different types of consumer opportunities. Today, Alimentaria remains committed to promoting the food and drinks industry and increasing its international presence. This has made it an international leader among industry trade shows. Multiple Foods, the new hall for trends and special products will include Organic Food, Olivaria, Expoconser, Interpesca, the International Pavilions, Lands of Spain, Snacks, Biscuits & Confectionary, Expoconser, Mediterranean Foods, Healthy Foods and Fine Foods; in addition to the Premium area and the Olive Oil Bar. Alimentaria 2016 will continue to focus on maintaining and strengthening the main foundations of its growth: internationalisation, innovation, gastronomy and specialisation. Some of Alimentaria’s shows and content are also being re-imagined in exciting new ways. Alimentaria 2016 will double its efforts to attract buyers from all over the world, especially Asia, the United States and Latin America, as well as Europe. Firms from over 50 countries will be exhibiting at the show, making Alimentaria a leading international event. The Alimentaria Hub will again be the main focus for innovation, internationalisation and business. The area will host more than 10,000 meetings between exhibitors and international buyers, as well as providing a major showcase for trends in the food industry. Various experts will analyse the present and future of the sector and demonstrate the most innovative products. The Alimentaria Experience, a space for culinary creation, will feature the hottest chefs of the day, the biggest Michelin ‘stars’. Alimentaria 2016 has reorganised its shows to keep pace with the market, reinforcing key shows and expanding the options available to exhibitor companies.